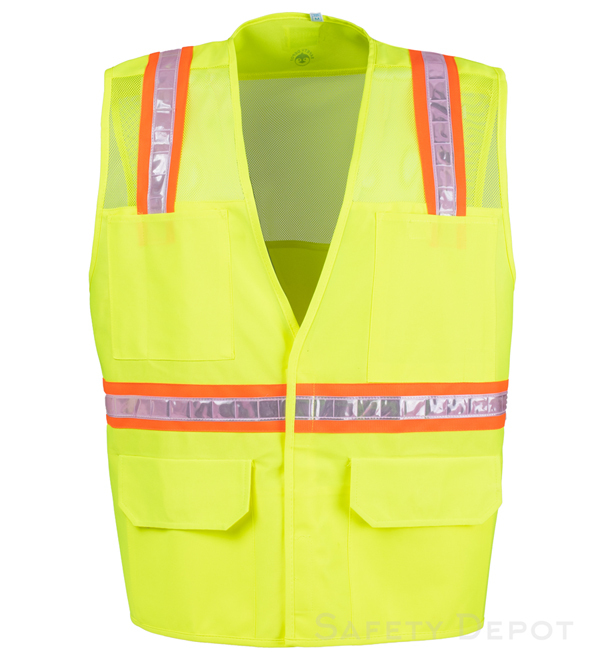 Light weight, comfortable fit, high quality safety Vest with reflective tape. Reflective PVC tape has a high gloss finish to help enhance the visibility of the wearer in nighttime or low-light conditions when illuminated by headlights. They are sewn in and runs horizontal, vertical, front to back. Two lower outer flap pockets for secure and quick access to accessories or tools. Two lower inner pockets for more secure and discrete placement of items. Two upper outer pockets for more sensitive items that are too risky to place in lower pockets. Also the upper right chest pocket is divided to have a small section for stencils and the upper left is divided into four sections spacing an in apart. Generous arm cut for greater mobility. Washable up to 25 times.